DELTA, B.C. 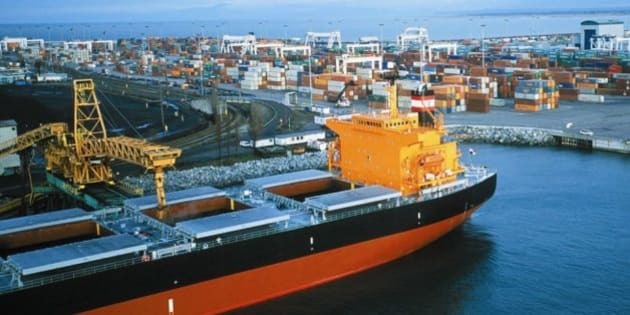 - Canada's largest container terminal will be part of a multimillion-dollar expansion to include new facilities for inspection of offshore cargo arriving at two Vancouver-area ports. Besides the Roberts Bank coal terminal at the Deltaport causeway on First Nations land in Delta, B.C., Port Metro Vancouver will also build a new inspection facility at its Burrard Inlet terminal in Vancouver. The $106-million project announced Wednesday will include nearly $50 million from the federal government. International Trade Minister Ed Fast said the marine container examination facilities will improve security and help to increase exports to new markets by reducing processing times. He said the joint Canada-U.S. cargo security strategy will facilitate the movement of shipments between Canada and its neighbour to the south, the country's biggest trading partner. "We want to make sure that our trade with our partner remains robust," Fast said after the announcement at the Delta port. "We want to remove barriers at the border and move our security to the perimeter of our two countries and this is another step in that direction. "The United States does have a very serious concern about the security and entry into their country of containers and products that could represent a security risk and we share those concerns." Fast said he couldn't identify any security issues from past shipments arriving at the two Canadian terminals. About $172 billion worth of cargo arrived at the terminals last year, mostly from Asia, and further shipments came through the Port of Prince Rupert in northern British Columbia, he said. Port Metro Vancouver president Robin Silvester said the new cargo-inspection facilities will include the latest technology to analyze containers and that the Deltaport facility is expected to provide jobs for Tsawwassen First Nations members. "We're expecting that because it's literally on their doorstep there will be employment opportunities both in construction and in the ongoing operations of the facilities," he said. Silvester said the two inspection areas near the terminals will replace one in Burnaby, B.C., where Canada Border Services Agency staff currently inspect containers. "It means that we don't have containers ... being trucked all over the Lower Mainland. It's better from an environmental and traffic point of view, and because the new facilities are bigger it will also allow the CBSA to do more inspections if they feel they are necessary." Every container that enters the terminals is already scanned for radiation, Silvester said. Port Metro Vancouver is currently working with industry on a new fee structure based on enhancement inspections, Silvester said. "With the combination of new technology and facilities nearer the ports it's possible the fees will be less but may end up being slightly more but that's still being worked out."